I have sold a property at 3988 31ST AVE W in Vancouver. This is a Prime, West of Dunbar, flat lot with a south facing back yard. The house is well kept and mostly original with a partially finished basement, five bedrooms and two baths. It's situated on quiet tree-lined streetof large lots and nice neighbouring homes. The lot size is 49.5x131.6 feet. The zoning is RS-5. There is a one car garage, a quiet lane and a deck off the kitchen. Renovate, Invest for rental or build. Close to Memorial West, Chaldecott and Pacific Spirit Park. An easy walk to the Dunbar High Street for shopping and St George's Private School. In the Lord Byng High School and Southlands Elementary Catchment. YOU'LL LOVE IT! I have sold a property at 106 1955 WOODWAY PL in Burnaby. DOUGLAS VIEW.This is a great two bedroom and one bath unit with a large private patio and outdoor space facing west for the warm afternoon sun. Functional and practicallayout with nice sized rooms. It's Walking distance to Brentwood Mall, parks, restaurants, schools and the Skytrain for an easy ride downtown for work or play. Well kept building with beautiful spacious grounds. Rentals are allowed but sorry no pets. It's perfect for investors or first time buyer's. YOU'LL LOVE IT! I have sold a property at 1205 19TH AVE E in Vancouver. This is the Cedar Cottage home you have been waiting for. Large 3 level 3 suite 1924 Character home. The present owners have restored and updated over the years. Including 3 yr old roof, windows and blown insulation in ceiling & walls.Legal basement suite, and another suite up. Beautiful mature country garden with 3 private patios to enjoy. A short 2 blk walk to Charles Dickens school. 4 bathroom 6 bedrooms. Each suite has its own gas fireplace. Current long term tenants. Great investment or holding property. 49.5x122 corner lot RT-10 zoned gives many future options, laneway? Coach house? Duplex? or? Tenanted so first showing times are BY APPOINTMENT ONLY Thurs May 14 5:30-7pm, Sat May 16 10am-noon,and Sun May 17 3-5pm. I have listed a new property at 3988 31ST AVE W in Vancouver. This is a Prime, West of Dunbar, flat lot with a south facing back yard and no large trees. The house is well kept and mostly original with a partially finished basement, five bedrooms and two baths. It's situated on quiet tree-lined streetof large lots and nice neighbouring homes. The lot size is 49.5x131.6 feet. The zoning is RS-5. There is a one car garage, a quiet lane and a deck off the kitchen. Renovate, Invest for rental or build. Close to Memorial West, Chaldecott and Pacific Spirit Park. An easy walk to the Dunbar High Street for shopping and St George's Private School. In the Lord Byng High School and Southlands Elementary Catchment. YOU'LL LOVE IT! Please visit our Open House at 3988 31ST AVE W in Vancouver. I have listed a new property at 88 26 AVE E in Vancouver. I have sold a property at 68 26TH AVE E in Vancouver. MAIN STREET. PRE-SALE. New homes by BRICKLANE DEVELOPMENTS. Modern or Heritage. Your new Main Street home is perfectly situated. Shopping on the High Street, playing at Riley Park and Community Centre, catch some ball at Scotiabank Field.Easy walk to General Wolfe elementary. There are three bedrooms and two baths up with Master ensuite. Open plan main where the family gathers, mudroom and attached garage. Down is a recroom and more space for you or a perfect in-law suite. Lots of storage in the crawl space. This is your chance to get the home you want in the area you want. Move in Spring 2016. Photos are repesentations from previous projects. Unfinished area is attached garage space YOU'LL LOVE IT! VANCOUVER, B.C. – May 4, 2015 – Strong home buyer demand coupled with below average home listing activity has created seller's market conditions within the Metro Vancouver* housing market. The Real Estate Board of Greater Vancouver (REBGV) reports that residential property sales in Metro Vancouver reached 4,179 on the Multiple Listing Service® (MLS®) in April 2015. This represents a 37 percent increase compared to the 3,050 sales recorded in April 2014, and a 2.9 percent increase compared to the 4,060 sales in March 2015. Last month’s sales were 29.3 percent above the 10-year sales average for the month. New listings for detached, attached and apartment properties in Metro Vancouver totalled 5,897 in April. This represents a 0.9 percent decrease compared to the 5,950 new listings reported in April 2014. The total number of properties currently listed for sale on the region’s MLS® is 12,436, a 19.8 percent decline compared to April 2014 and an increase of 0.5 percent compared to March 2015. The MLS® Home Price Index composite benchmark price for all residential properties in Metro Vancouver is currently $673,000. This represents an 8.5 percent increase compared to April 2014. The sales-to-active-listings ratio in April was 33.6 percent. This is the highest that this ratio has been in Metro Vancouver since June 2007. Sales of detached properties in April 2015 reached 1,815, an increase of 35.9 percent from the 1,336 detached sales recorded in April 2014, and a 70.6 percent increase from the 1,064 units sold in April 2013. The benchmark price for a detached property in Metro Vancouver increased 12.5 percent from April 2014 to $1,078,900. Sales of apartment properties reached 1,579 in April 2015, an increase of 34.7 percent compared to the 1,172 sales in April 2014, and an increase of 50.1 percent compared to the 1,052 sales in April 2013. The benchmark price of an apartment property increased 4.4 percent from April 2014 to $394,200. Attached property sales in April 2015 totalled 785, an increase of 44.8 percent compared to the 542 sales in April 2014, and a 53.6 percent increase from the 511 attached properties sold in April 2013. 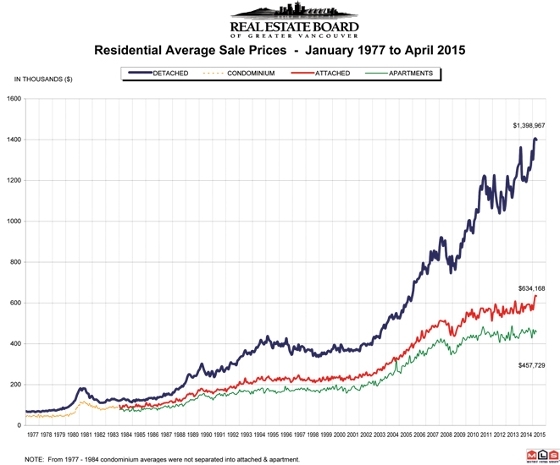 The benchmark price of an attached unit increased 5.7 percent between April 2014 and 2015 to $493,300. I have listed a new property at 68 26TH AVE E in Vancouver.